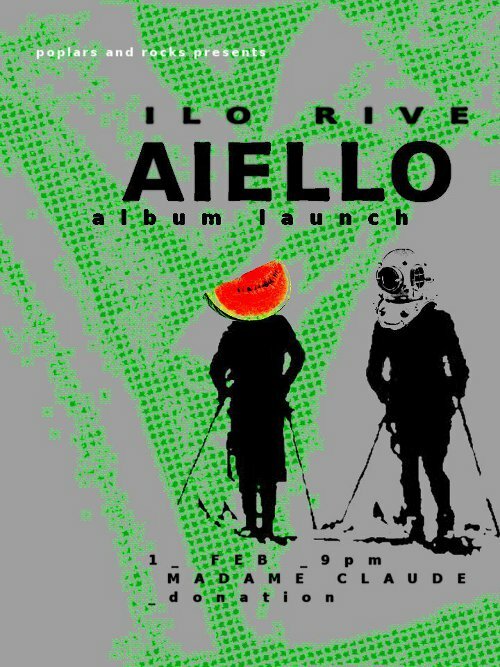 poplars and rocks presents february 1st at madame claude: aiello and ilo rive. AIELLO is a young canadian, who was thrown on the shores of the river spree some years ago. he just finished his latest full-length album: later’s baby! in march follows a tour for the album – alongside no one less than sean nicholas savage (my personal discovery last year and who we nearly presented at madame claude, hadn‘t he played a different night. )… record release show! ILO RIVE is a paris born musician, singer songwriter, and actor, who grew up largely in the states, and spend his life travelling between paris, london, and new york, where he spearheaded the band Die Romantik, when after break up he only logically had to make his way to germany to settle finally in berlin. after entertaining bridges all over the world with his guitar and stories he collected on both sides of the atlantic, he meanwhile joined one of the newer circles of singer songwriters in town, partly even organising his own nights with bands and friends that makes him welcome also as a colleague… his first ep „one two, for you“ was released two years ago; the new is waiting to be mixed and will be out soon this year. 1st february 2013, madame claude, lübbener strasse 19, berlin. doors 9pm, start 10pm, dj on at midnight, on decks ourselves as rad spin rotate club, admission is donation. flyer by j. photos of acts on up-coming (or past shows then). facebook event via our page there.